Sgt. Christopher Scroggs surprises his children in return to Burlington Twp. Sgt. Christopher Scroggs comes out of hiding as his unsuspecting son Travis and daughter Tegan rush to him for a hug. Being surrounded by our loved ones during the holidays is something many of us take for granted. It’s important to remember those among us who spent their holiday without key members of their families. Some have jobs that require them to work through Christmas or New Year’s and some, like Burlington Township resident Sgt. Christopher Scroggs, were overseas serving their country. Scroggs is a member of the U.S. Air Force recently deployed in South Korea, far from his family for six months. Foreign deployment comes with its own fair share of hardships but being away from his family is what Scroggs struggles with most. “It’s missing things and not being able to help. It’s not the job, it’s not the mission it’s just missing this stuff and not being able to help out my wife taking care of the home,” he said. 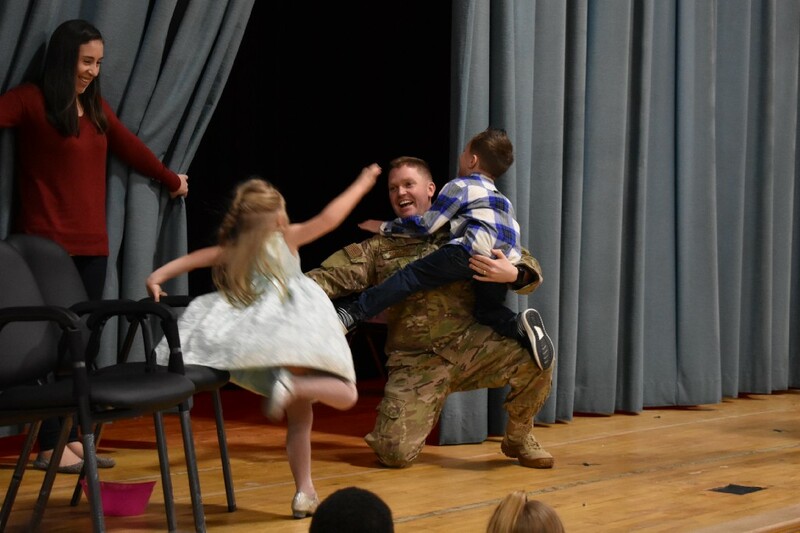 When he learned he would be coming home in time for the holidays, he and his wife Helen set about planning a surprise for their son Travis, a first grader at Bernice Young Elementary, and their younger daughter Tegan. Working with Kate Solewin, the school’s guidance counselor, and Sara Cox, a behavior specialist, they came up with a unique way to break the exciting news to their children in person. “When we heard about it from Mrs. Scroggs it was exciting for us. I had never done this before so I was really excited to plan it. Sara and I worked together to try to find something that would be great for the kids. Low-key but still powerful for the child to see,” said Solewin. The final plan was to stage a mock game show that would end in a big reveal. On Thursday, Dec. 20, Travis’ first-grade class was called to the school’s auditorium for a special assembly and guessing game. Students who were selected as a contestant were led out of the room while the remaining students were shown an object. The mystery object was then hidden and the contestant was let back into the room to guess the object based on clues from the audience. The final contestants selected for the game show were Travis and his sister Tegan. When they left the room, the crowd was shown a giant teddy bear. After Travis guessed the hidden object, the bear dropped down to reveal his father hidden behind. The two children immediately jumped from their seats to embrace their father with cries of joy. Before the reveal Sgt. 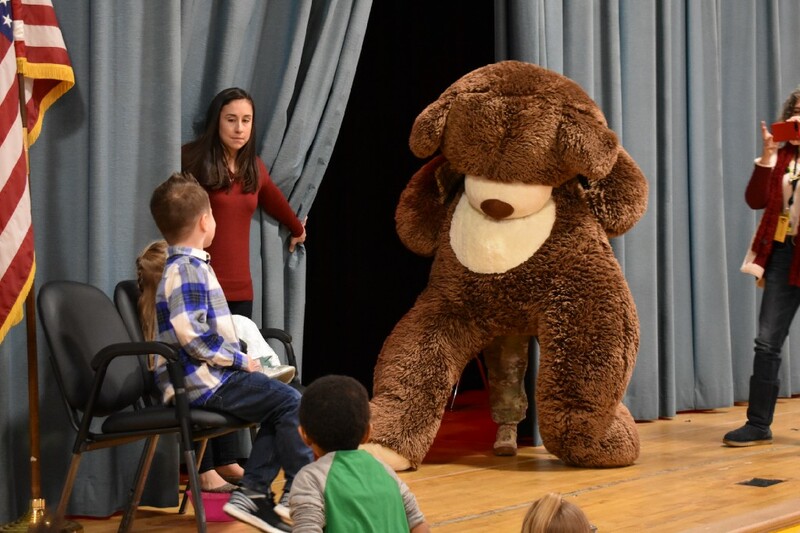 Scroggs hides behind a giant teddy bear while his son Travis and daughter Tegan sit in the contestant seats while playing a guessing game that acted as a cover for the big surprise. “It was so heartwarming, especially around the holidays,” said Solewin, who had previously worked with Travis helping him write letters to his father. Scroggs will be home for the next month and is looking forward to spending it with his family and especially being with them on Christmas. “This makes my Christmas, and I hope it makes theirs. They’re only young for so long, so I get to see some magic. We’re going to have it as one big family,” he said.